RSS Feed for keyword: "Pictures of Western Brook Pond Newfoundland"
A popular destination for visitors to Newfoundland, Gros Morne National Park features interesting sights such as Western Brook Pond, the park's largest lake. Carved out by glaciers, Western Brook Pond is a fresh water lake in the Long Range Mountains, which form the northernmost section of the Appalachian Mountains on the Great Northern Peninsula of Newfoundland. 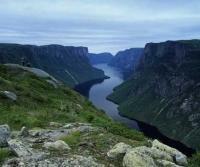 Western Brook Pond was once a fjord, open to the sea, carved out by glaciers from the plateau. After the recession of the ice, the land rebounded and cut the fjord off from the sea. Eventually the salty water which filled the lake was flushed out by the fresh water fed by Stag Brook and the numerous waterfalls cascading over the steep cliffs from the plateau above. 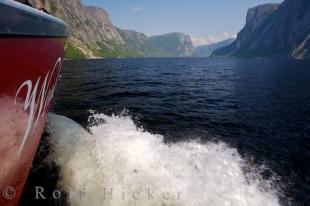 Interesting Photo galleries related to "Pictures of Western Brook Pond Newfoundland"
One of the best ways to see Western Brook Pond in Gros Morne National Park is by booking a tour by boat with BonTours. 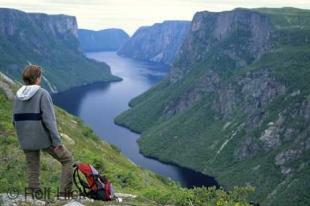 A tourist looks out over Western Brook Pond situated in Gros Morne National Park in Newfoundland, Canada.